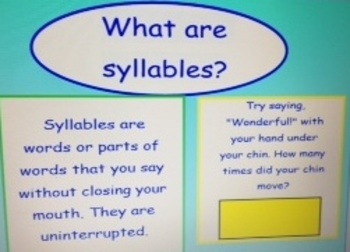 This SMART Notebook file introduces students to WHAT is a syllable, WHY is it important to know syllables, and HOW to find them in a word. Students are led to place their hand under their chin as they say a word and count how many times their chin goes down (no clapping out syllables…this is more accurate). 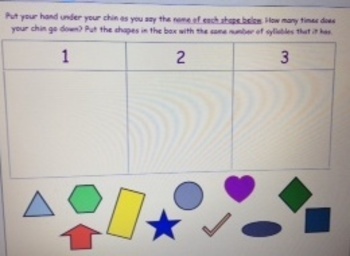 Students will practice finding how many syllables are in the names of the math shapes they see and place them in a chart. 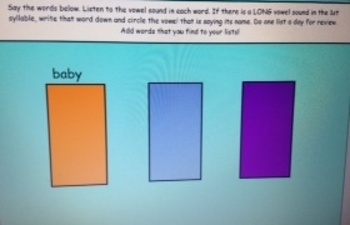 Next, students are linked to a fun robot game online to practice syllables. 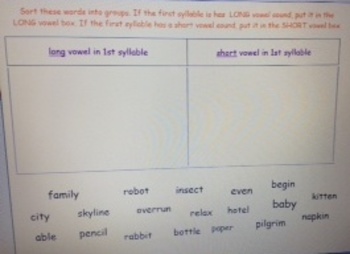 Finally, once they can identify the syllables in a word, students practice decoding two-syllable words with long vowels. Students identify the word's first syllables and they are led to writing down, circling, or sorting those words in various slide activities. Students are invited to add words they find to the file for future practice too. This 13 slide file can be reused over and over for review and practice all year long!